This post is sponsored by Imperial Sugar. As always, all opinions and recipe are my own. Thanks for supporting the brands who support Shared Appetite! Looking to get your creative Christmas cookie baking on? These Red Velvet Peppermint Chocolate Chip Cookies are big on flavor and super easy to make! I love mint. Not that spearmint or wintergreen crap. Peppermint. The real deal mint. And peppermint and chocolate together? That’s what I’m talking about. But my dad. He takes the mint chocolate love to a whole new level. The dude is obsessed with it. So what’s an amazing, thoughtful, caring kid to do? Feed his father’s addiction, of course. And guys. These Red Velvet Peppermint Chocolate Chip Cookies. They are legit. Super moist. Full of peppermint chocolate flavor. And that color… it just screams Christmas cheer. I know, this is my second crinkle cookie recipe in the same week. Remember those Chocolate Orange Truffle Crinkle Cookies? But what am I supposed to do? These things are so darn festive and fun to make. Can you blame me? Are there any more questions I can fit into this paragraph? And you know what… this isn’t even my last crinkle cookie recipe for this year! Ha! I’ve got one more coming at ya in a few days. Boom. That’s right. I’m on the crinkle cookie train and there’s no stopping it. The rolling around in powdered sugar before baking (i.e. the crinkle effect) is completely optional. It does make the cookies look extra pretty, but I will be straight up with you… Asheley requests her cookies crinkle free. You see, she gets a little over enthusiastic with the speed in which she devours cookies. And have you ever tried to quickly inhale a cookie with powdered sugar? Yea, let’s just say it’s pretty funny to watch. 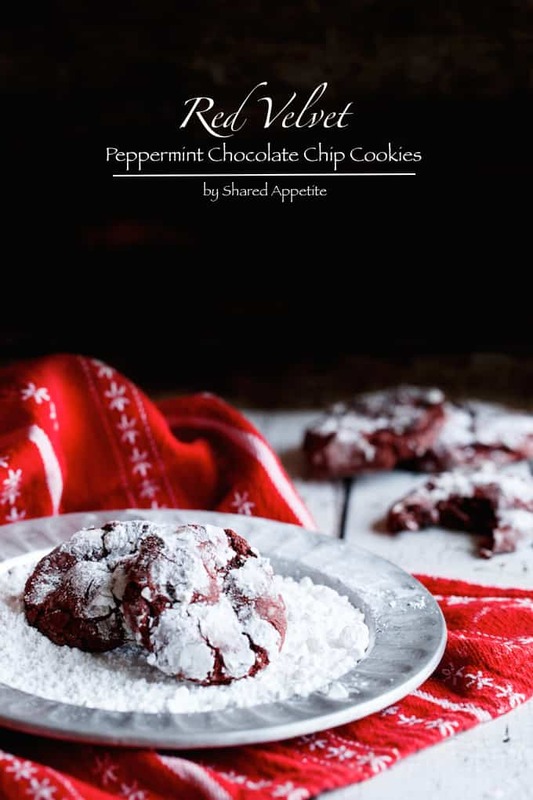 You can snag this quick and easy creative Christmas cookie recipe for Red Velvet Peppermint Chocolate Chip Cookies over at Imperial Sugar. 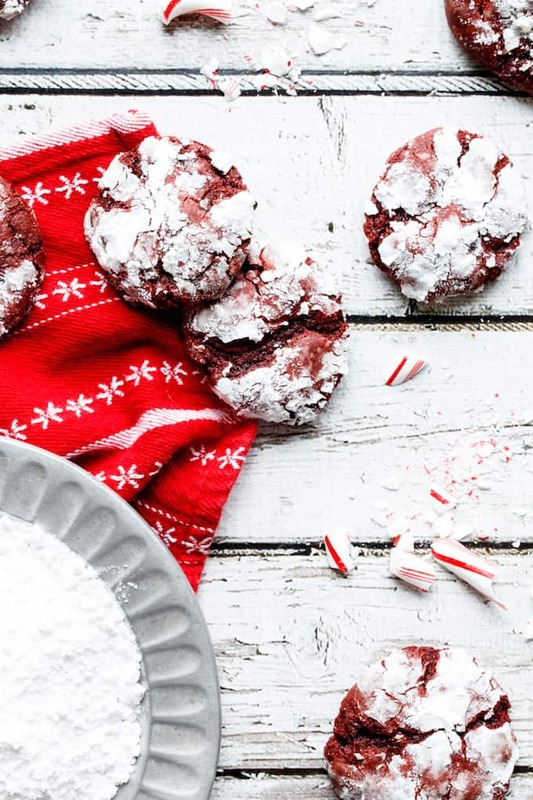 Hey, Crinkle Cookies are like THE cookie of Christmas, so keep them coming! TOTALLY obsessed with this combo Chris, so creative! Pinned! Hahaha thanks Taylor!! Merry Christmas to you and Mr. FFF!!! You’re on a crinkle cookie roll, and I say GO WITH IT, Chris! These look absolutely delicious! Haha thanks Becca!! Glad you are enjoying the crinkle roll! Hahaha thanks Justine. Glad someone gets my humor! Oh crinkle cookies! I love the holidays because we get to see (and eat) so many different kinds. I’m like your dad and can’t get enough of the peppermint + chocolate combo 🙂 these look amazing! I love Christmas cookies! These look amazing! I was just about to say. . two crinkle cookies back to back?!!! But it’s awesome! these cookies are Christmas, yo. . so bring it on!! Wow! yes! Peppermint + chocolate = perfection. love these cookies and wishing you and Ashley a beautiful Christmas and happy new year!! Hahaha two… make that three. I just posted another one HAHAHA. Merry Christmas to you and your family Alice! These pictures Chris! Gah! So gorgeous, I can’t even handle it! I LOVE this creative spin on a crinkle cookie, so inventive! Keep that train rollin’, Chris! I’m a peppermint girl (okay, and I like wintergreen a lot too!) but UGHH please no spearmint. I wish I had a batch of these cookies right now – they look awesome! A Christmas cookie tray wouldn’t be complete without crinkle cookies and I love both of these versions you made! 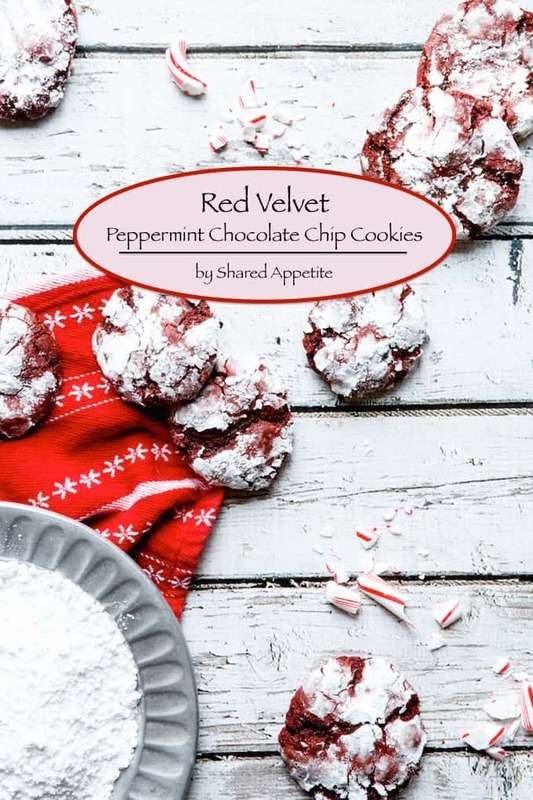 These red velvet peppermint ones look gorgeous and totally scream Christmas! Thanks so much Kelly! Merry Christmas! These cookies look awesome, Chris! Red velvet is one of my favorite things, but I have never had it in a cookie. I’m totally going to have to make these for Christmas! Thanks Beth! I know, I’m a sucker for red velvet as well!